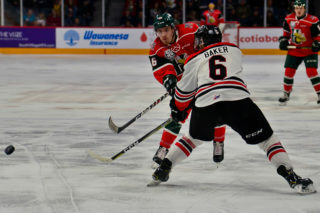 The rivalry between the Mooseheads and Wildcats was at its best on Saturday night and thanks to a complete effort from the home team, Halifax came out on top 5-1 in an exciting matchup at Scotiabank Centre. “I think our depth guys really made a difference today so I think it shows that we’re a complete team. 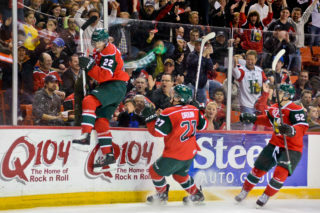 I think it’s our best game of the year so far,” BO Groulx said following the Mooseheads’ performance against Moncton. 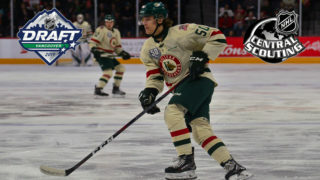 Groulx helped to set the tone early with his tenacious play and scored the first two goals for the Moose en route to earning the first star of the game. It was a battle that featured plenty of penalties, especially during a rough and tumble second period that saw a fight between Patty Kyte and Dylan Seitz and then a melee about one minute later with 11 different infractions handed out at the 15:41 mark. That made for some crowded penalty boxes while Kyte was dealt a game misconduct following his tussle. “We don’t like them and they don’t like us so it’s always a little bonus beating them (Moncton),” Groulx added. Halifax continued a recent trend at home by jumping out to an early lead on Groulx first goal coming 3:36 into action. The Anaheim Ducks prospect found the net by picking the top corner on the near side over the glove of goalie Francis Leclerc. The Mooseheads have scored not later than 5:14 into the game in each of their last seven home games. Groulx wasn’t done there. He slammed in his second of the night on the power play later in the period to make it 2-0 Moose. The former first overall pick in the QMJHL pounced on the puck after a Samuel Asselin shot bounced off the end boards behind the net and back in front where Groulx was waiting. This was the second game in a row that Head Coach Eric Veilleux put the trio of Groulx, Asselin and Durandeau together. Groulx is second on the team in scoring with 47 points on 22 goals and 25 assists. The Wildcats showed some life when they cut into the lead 2-1 with a Jakob Pelletier power play goal at 17:39 of the first period but thanks to some solid play from goalie Alex Gravel and a continued all-around effort by the rest of the team, that was as close as Moncton would get. Samuel Asselin put the Moose up 3-1 only 19 seconds into the second period when he fired in his own rebound off the rush. It was the only goal of the period and the visiting Cats started to show their frustration after that point. 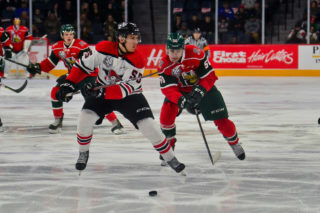 The third biggest crowd of the season in Moose Country was more than delighted with the way things were going and gave their team the boost they needed to put Moncton away. 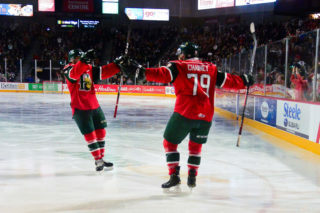 It seemed the 9,717 fans got louder with every Mooseheads goal and had the building rocking in the third period when Arnaud Durandeau and Raphael Lavoie scored back to back tallies to put the game away. The fans got into it even before the game started as they gave a great welcome back to former Mooseheads Captain Trey Lewis who carried the Memorial Cup to centre ice alongside Mayor Mike Savage and QMJHL Commissioner Gilles Courteau. The Commissioner was in town with the Memorial Cup and President Cup as part of the league’s 50th anniversary tour. 3 Stars: BO Groulx’s two goals gave him the first star, Jared McIsaac had two assists and played a fine defensive game to earn the second star and Samuel Asselin was named the third star with a goal and an assist. The Mooseheads have won three straight games to improve to 32-10-2-1 and will not play again until they visit Moncton next Saturday at 7pm. The next home game is next Sunday, January 27th at 3pm versus Chicoutimi.